A Big Help | 2P START! We harped on the idea of Toad being a big player in the ‘seedy underbelly’ of the Mushroom Kingdom back in our Real Estate in a Virtual World comic, but since New Super Mario Bros. Wii is so much like SMB3, it seemed appropriate to give the idea a full comic on its own. Also, since Mario and Luigi are of Italian descent, why wouldn’t Toad be too? I liked the idea of him being a mafia-type thug. That’s why Mario ain’t gettin’ no favas…fuggedaboudit! He flipped two Bowser in a row? Took me a while to get the punchline. I guess it is NSMBWii inspired? He failed to get any item at an item house. sorry guys, but i dunt geddit… This comic USED to be good…how dare you? No comic is still good, but if they were to use more clear and understandable references it would be easier to get more laughs. It is a clear reference, if you’ve played NSMBW. Say are you guys going to review the game. New Super Mario Bros. Wii looks great can’t wait to get a copy. I can’t tell you how much this has happened to me! I think that the problem is that if you’ve played the game, you get it before even reading the text and if you haven’t, then you’re still puzzled. Also, I felt that the fuggedaboutit was out of place. Sorry, just kind of a let down after last week’s. Finally I’m rising from my Grave. I wanted to do this on podcast 100, but I figured I would get allot of competition (Didn’t believe the 100 Risers anyway) so I thought, let’s do it on Podcast 101 for a symbolic rising from the grave, but again I figured…that’s what more people would do, so I set the goal of rising on 102…but I forgot so now I am rising in honor of 103! Yes I am rising for my own goal of making it into a Podcast how evil am I? And if the previous wasn’t evil enough, I have actually been following the comic since #026 after updating my own wii and finding the clock I accidently stumbled upon this Internet Comic after a Google search (Friends and I were having a debate if it was there or not to begin with) and sticked with ever since. However I’ve just been following the podcasts since #75 and listening back once or twice a week to catch up, I’m glad I didn’t let more podcasts go by. Now as for today’s comic: Brilliant!, it’s something you don’t quite often wonder about. The princess is kidnapped, the kings transformed into random animals and you Mario Mario have to save mushroom kingdom…but toad(s) seem to want you to play games for the items and lives, and instead of giving you all three the items from the boxes they give you just one…almost as if Toad wouldn’t want you to save the Mushroom kingdom. And this comic lets that know very simple trough one Panel and some words. The people above me shouldn’t criticize the comic because they haven’t got SMB Wii yet, but this comic ranges from more than that, this goes back to SMB3 as explained by Tim. Now for something completely different, I gladly joined the forums and as per normal after registering you get taken to your inbox where a welcome message awaits…but wait…what’s this? No welcome message? How dare you! May your Wii get a blue slot of death! Anyway, that’s it for this, quite lengthy rising from the Grave, expect a post from me every comic and podcast from now on and perhaps even find me active on the forums who knows. Goodbye for now and kind wishes from the Netherlands. I think this weeks is a decent comic. I think that I like it a bit more because I always imagined Tingle in WW doing sort of the same thing. The first time I played through, I was like “I’m trying to save the freakin’ world here! Can’t you give me a discount?” So remember: If Ganondorf takes over the world, it’s all Tingle’s fault for being a greedy, slave driving creep. And it looks like Toad has been doing his fair share of penguin murduring too… Though I guess that happens when you’re in the mafia. I stay away from 2D Mario games, so I’m totally lost. Not really your fault though. Why would you stay away from 2D Mario games? 2D Mario games are amazing…for the most part. They infuriate me. Anything with instant death tends to tick me off. Mirror’s Edge is about the only thing that falls under that category that I liked. Super Paper Mario was good though because if you fell off a ledge you lost 1/35 of your health. Good comic guys, not great. Its a funny idea but Toad does seem a little out of place. Still can’t complain when it makes you laugh. Oh why, Toad, why?! Do you not love the princess? Does Peach not deserve your kind? Oh, if you were in Bowser’s kingdom, you would surely be present in his next entree. Oh, the humanity! Is this out of hatred for Mario’s ravenous consumption of your lifeless brothers? Is this out of protest of animal cruelty? Oh why, Toad, why?! How would Toadette feel if she found out about your despicable underground dealings? How would YOU feel? Something wicked this way comes, and you are surely the one leading it in. Oh why, Toad, why?! Anyways, nice comic guys. The joke was funny and ironic, showing the true nature of this the seedy underbelly of the glorious mushroom kingdom. Hey Ray, unrelated, but those pixel icons in comic 58, The Makeover, last panel. Do you know where to get them? I love pixel art, so those icons would be perfect. Please. This bugs me in a lot of games. You may be single handedly standing against an evil so powerful that it can destroy the universe, but your employers will only ever start you with rags and a pea shooter. If you want anything half decent… well, you’d better have the cash. Eh. I got the joke, but I didn’t laugh like I usually do. The fact that it’s just one panel sorta implies that it was a last minute thing. I love the site, but I think that between the baby and everything, you guys can’t pull off the Tuesday-night comics with the same elegance you usually do. At the risk of being an unhelpful internet-critic person, I think you should take two weeks off the comic, and spend the time trying to get ahead a little bit- throw some ideas around, and maybe Ray could find the time to do a comic or two AND go to bed at a reasonable hour. Even though you have said that sometimes your greatest ideas come from the pressure of having to do a comic (“Press A to marry her!” still makes me laugh so hard it hurts) I don’t think that having a bit of a buffer would be a good idea. Pressure makes diamonds, but if they crack, all you’ve got is a shiny rock. Once again, I love the site, and listen to the podcast religiously (I’m one of those people who listens to an episode a day, every day) but I think that a two-week headstart of sorts would do wonders, for Ray’s sleep, if nothing else. In any case, thanks for the free entertainment. P.S.- At the risk of destroying comic productivity, here’s a link to a game, Ray. It’s beautiful pixel art and absolutely hysterical. Sort of Indiana Jones lite on steroids. I’ve died 300 times and I’m still going back for more. If you do take the two weeks off, then you have to keep doing the podcast. My head would explode without my weekly dose of monotone. I really appreciate your thoughts, Pi. I can’t say I’m completely happy with how this one turned out, but I wouldn’t mind discussing some of your thoughts with Tim on the next podcast. I do feel inclined to reiterate- even if you do choose to take a comic hiatus, then under no circumstances should you stop doing the podcast. I don’t care that you may or may not have anything comic-related to talk about, I need my weekly fix of monotone, or you will be reading about me in the paper- as in ‘Boy Kills Seven in Rage, Yelling About ‘Musical Misfits’. After seeing a cold and cruel Mario in the last comic, it’s kinda nice to see him taken down a few pegs here. And for some reason, I really like the image of Toad looking stubborn with his arms crossed. There’s just something about a cute lil’ guy looking determined. NCG! i would like to see a extra panel where Mario is walking away with a mushroom but then a toad walks in and sees (sorry for this being disturbing but) a dead toad! I’m not exactly the biggest Mario player and I only got the general idea of what was going on. I got a good laugh out of it, but I’m hoping its in the right context. That said, I particularily enjoyed the art this week, the facial expressions on Mario and Toad are priceless. Also, I love the backround – you can see the question mark boxes on the wall if you look the right way. Great comic, I just hope I read it the right way. As do I. I see what Tim and Ray are going for. But I think they needed one or two more panels for us that don’t own the game to get more of a exact understanding. I thought it was funny, but it just took a little bit to understand it. I am guessing this is one of thous stop areas where you can collect power ups by doing some mini game of sorts but Mario failed. Thous little mushroom pricks. Hmm… I get the feeling I won’t fully appreciate this until I receive and play my currently-shipping copy of NSMB Wii… though I’m guessing that this means NSMB Wii has another mini-game akin to the one found in SMB 3? My guess, It’s Lilly’s fault. Tim is so busy with Lilly that all he can think of is one panel comics. And now 2pstart as we know it is coming to an end. Me, being the most die-hard fan, will now cry in my sleep until i realize that the only way to fix this is to personally pay for a baby sitter for Lilly. Or i can realize I’m broke and just hope that it’s NSMB Wii that’s taking up Tim’s time and will soon ware off so we can get back to normal comics. I’m hoping for the later. 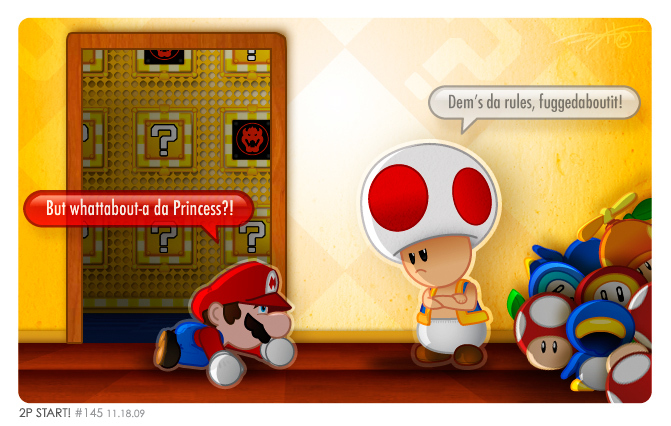 Wow, Toad must make a lot of profit every time the princess is kidnapped. It makes you wonder if Toad hires bowser to kidnap peach. Maybe that is why Bowser seems to put a switch at his bridge. I know why Mario did what he did last week. He needed the power up. Sorry you didn’t even get 1 powerup! And there is my vote for best comment ever. Due to the rising value of the Bell vs. the Coin, Tom Nook’s influence begins to spread to the Mushroom Kingdom. Hm….didnt get it at first. Kind of those “inside info” comics. See ya next Monday! Eh, Decent Comic Guys. The art was nice, but the joke was a little hit-or-miss. I got the joke (since I already have NSMBWii), but the wording of “fuggedaboutit” was hard to figure out initially and really felt out of place. That being said, this comic is in no way horrible, just not one of your best either. Wait, does this mean that the Toads are actually a Italian Mafia? And doesn’t that mean that THEY kidnapped Peach first, brainwashing her and tricking Mario and Luigi into believing that Bowser was the enemy, when, if fact, he was trying to rescue the princess all along? Awesome, guys. Not only has this happened to me *several* times while playing, it also highlights one of the hilariously weird things about the Mario world: If the Toads are trying to help the princess, why don’t they just give Mario every power-up they’ve got? Is this the death of 2P START? I am considering leaving, now write me a song Ray. It is time that I RISE FROM MY GRAVE and join Tim and Ray’s Undead Army ! I just discovered 2P Start and became instantly in love with the style and humor of both the comic and the podcast. I’ve personally done podcasting, and currently am working on a web comic, and I have huge respect for the time and effort that you guys must spend on behalf of those in the undead army. It seems strange to me that so many people are saying that it took them some time to understand this one. I haven’t played NSMBWii yet either, but Toad has been doing things like this since SMB3 — whether just the fact that he would only let Mario take one of three items or that sometimes he had to play by the rules of the Memory-like card game before Toad would give him anything. It looks like it works a bit differently in NSMBWii and by association in this comic, but I recognized the concept almost immediately. I guess if this many people are confused by what’s going on, something about the comic could be improved; but, at the same time, spelling out a joke like this too much could make it lose some of its subtle humor. So I don’t think Tim and Ray should be blamed for some people not “getting” this one. They seem to have had their reasons for making it the way they did. I gotta be really really really really really really really really honest. I’m dumping this comic into the category of my brain called “so bad it’s kinda good.” You know, like TIm’s Take or Mario Steriods. Not funny at first, but then you look back and find it funny becuase of how bad it is. I mean, I just didn’t find it funny truthfully. I take it you haven’t played NSMBW? It’s really a shame no one got this reference. Maybe they should have waited longer after this came out to make this joke, it’s not exceptionally stand-out good but if you get it it’s quite up to standards. I did this the first and only time I played that bonus game while wasting time in a gamestop. I always thought the same thing when I played the minigames in the Toad Houses. Seriously, Mario, just knock him out with a fire flower, then take all you want.